Massachusetts Attorney General Maura Healey outlined steps Wednesday to crack down on the state’s assault weapons ban. Gun buyers raced to snap up military-style weapons on Wednesday as Attorney General Maura Healey moved to bar the sale of rifles that have been altered slightly to evade the state’s assault weapon ban. “Because of this, we’re extremely busy,” said a sales associate at GFA ArmsTec, a gun shop in Natick, who added that she had to hang up to handle the crush of customers rushing to buy the assault rifles banned under Healey’s order. Mass Firearms School in Holliston went so far as to extend its hours to 11:59 p.m. to accommodate gun enthusiasts who were anxious to make a final purchase. “Today is your LAST DAY to purchase a semi-automatic rifle in Massachusetts!” the store wrote in an e-mail blast to its customers. The stores were responding to an order Healey issued to the state’s 350 gun dealers telling them to immediately stop selling “duplicate” versions of common assault rifles like the AR-15, which she argues are illegal under the state’s 1998 assault weapons ban. The gun industry has found a way to exploit state laws, a loophole of potentially horrific proportions. That ends today. The law bans duplicate weapons but has left it to gun manufacturers to define which weapons would fall into that category. Manufacturers exploited that “loophole,” she said, to produce assault rifles that had “small tweaks” but were functionally identical to the banned weapons. Some, for example, had no flash suppressor or featured a fixed instead of a folding stock. Last year alone, she said, 10,000 of the assault rifles — often marketed as “state compliant” — were sold in Massachusetts. She said the directive clarifies that duplicate guns are those that have internal operating systems that are essentially the same as illegal assault weapons, or have key functional components that are interchangeable with those of banned weapons. Jim Wallace, executive director of the Gun Owners Action League, the state affiliate of the National Rifle Association, said his office was flooded with calls from gun store owners who were blindsided by Healey’s ban, which she announced in an opinion piece published in Wednesday’s Globe. He noted the directive was crafted without input from gun dealers, owners, or manufacturers. Healey said she hoped to work cooperatively with gun stores to enforce the ban. And although she said the order took effect immediately, her office indicated it would not crack down on gun dealers who sold the weapons on Wednesday. Still, Healey’s office said vendors who continue to violate the ban could face fines, the loss of their dealers’ licenses, or prison time. She said no action would be taken against individuals who bought duplicate assault rifles prior to her order. 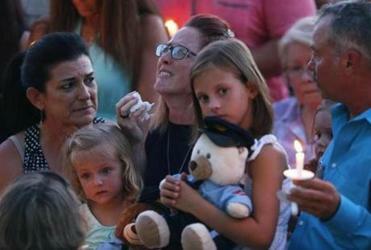 She described the ban as a response to the use of assault rifles in the mass shootings in Orlando; San Bernardino, Calif,; Aurora, Colo.; and Newtown, Conn., as well the attack that killed three law enforcement officers in Baton Rouge on Sunday. Still, she said, a broader solution to the problem of gun violence will require action by Congress. Governor Charlie Baker, a Republican, indicated his support for Healey’s ban. “Governor Baker supports the Commonwealth’s assault weapons ban, believes our comprehensive state gun laws work well in protecting the people of Massachusetts, and believes that the attorney general has the authority to enforce the law to crack down on the sale of guns that skirt the assault weapons ban,” said Billy Pitman, the governor’s press secretary. Gun shop owners said they were scrambling to respond to the directive, which they learned about only Wednesday morning. A spokeswoman for Smith & Wesson, the Springfield gun manufacturer that markets several “Massachusetts compliant” assault rifles, did not respond to a request for comment. David Johndrow, a sales clerk at Holliston Firearms, which has sold “state compliant” assault rifles, said the ban might push sales of those guns to the black market. 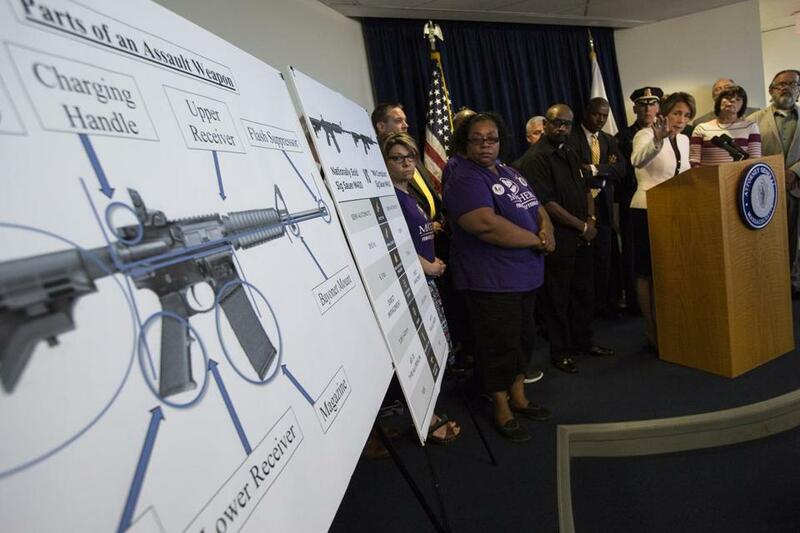 Boston’s police commissioner, William B. Evans, who was at Healey’s press conference, said the majority of gun violence in the city involves handguns, although his officers take about a dozen slightly modified assault weapons off the streets every year.